Hair Color: Blue Eye Color: Blue Birthday: October 30 Horoscope: Scorpio Height: 173cm Weight: 61kg Class: 3-D Blood type: A Tomoya Okazaki is the male protagonist of Clannad. Due to his habit of always arriving late to school, skipping classes during the day, and staying out all night, he has been labeled as a delinquent, or a young person who defies authority. He is a childhood friend of Kotomi Ichinose and is best friends with Youhei Sunohara. As he progresses through high school, he meets many new friends, such as Kyou, Ryou, Tomoyo, Fuko, and of course Nagisa. He has a knack for solving the problems of his friends, and seems to care for all of them deeply. He is also seemingly unaware that some of the girls at school show interest in him. The major story in Clannad is about Tomoya learning about the point of having family and friends. He also has alternate timeline counterparts that end up with Tomoyo and Kyou respectively in the anime. Ever since his mother, Atsuko, died in a car accident when he was young, Tomoya has been living with his father, Naoyuki Okazaki, with whom he argues constantly. Tomoya was injured during a fight with his father three years ago; since then, their relationship has been very distant. 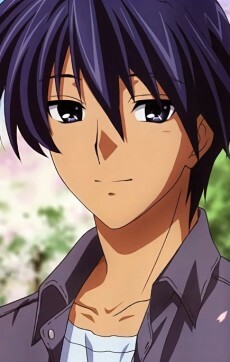 Tomoya later marries Nagisa, where they soon have a child, Ushio, together. But upon giving birth, Nagisa dies soon after. Having felt he has lost everything, Tomoya leaves his daughter Ushio to live with Akio and Sanae for the next five years, where he constantly works and wastes money to forget the pain of losing Nagisa. When Ushio turns five years old, Tomoya reluctantly takes her on a trip with him, where they quickly bond and he asks Ushio to stay with him. Ushio contracts the same illness as Nagisa, and, grief stricken, Tomoya quits his job to take care of her. She begs to go on a trip with him, and he agrees. As they walk towards the train station in the snow, Ushio collapses and dies in her father's arms. Tomoya, crying for Nagisa to help him, collapses soon after, and awakens to a world where Nagisa and Ushio survive. It is later found out that Tomoya had used the orbs of light to grant his wish of his wife and daughter surviving. The three live together happily as a family.